Despite this being a sewing blog, I thought I would share this recipe with you. It’s a hearty soup or stew that keeps me going for several hours so that I can focus on the projects that I want to without having to stop and eat a snack. 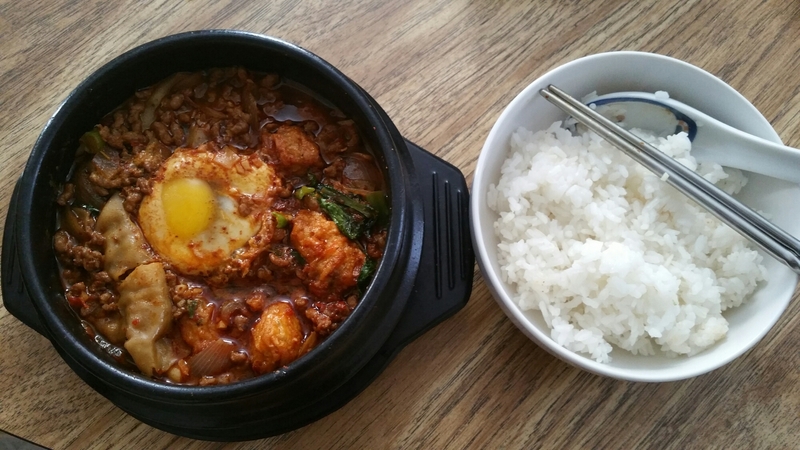 The basis of this recipe is the spicy korean winter stew soondubu jjigae or soft tofu stew. Unfortunately, I didn’t have any soft tofu but it turned out just fine. 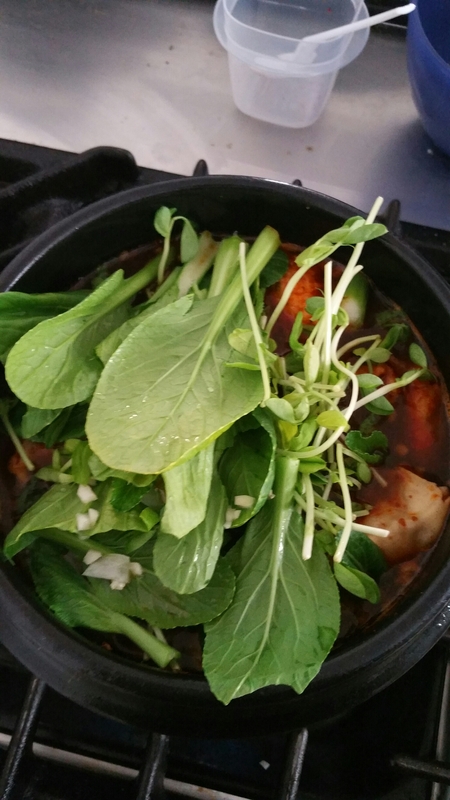 One quick note before we start: this highly customizable stew is cooked all together in a special clay pot called a dolsot and it is made specifically for this purpose. You can put it directly on the stove though you will need the matching plastic tray to handle it after cooking is finished. You don’t need this pot to make the stew but if you’re in the Korean grocery store to begin to gather ingredients you might as well check out their kitchen essentials aisle. Most shops sell these pots for a really decent price. There is an unlimited amount of uses for them so you can’t really go wrong with picking one up. Just don’t forget the plastic tray! 2 cups of kombu (seaweed) stock. Combine the dark soy, sugar, fish sauce, and cooking wine in a bowl. Stir until the sugar is dissolved. 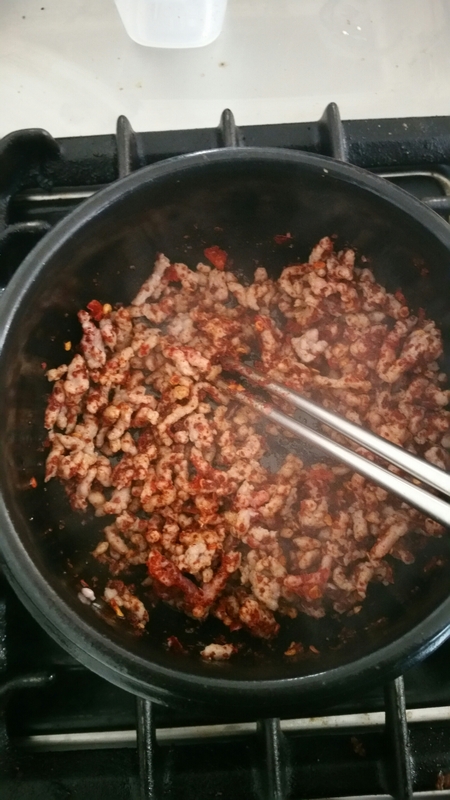 With your burner on high, heat 1 tablespoon of oil in the dolsot and add the ground meat. Keep the meat moving until mostly cooked. Add the ground red pepper and chili flakes. Stir to coat. Add the sauce mix, minced garlic, chopped onion, and half of the stock. Stir and bring to a boil. 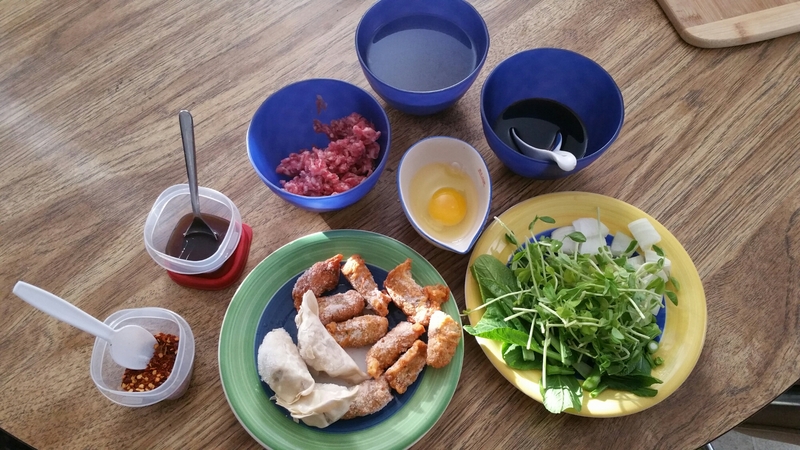 Add the pea sprouts, baby yu choy, gyoza, fish cakes, and the rest of the stock. Bring to a boil and add the raw egg. 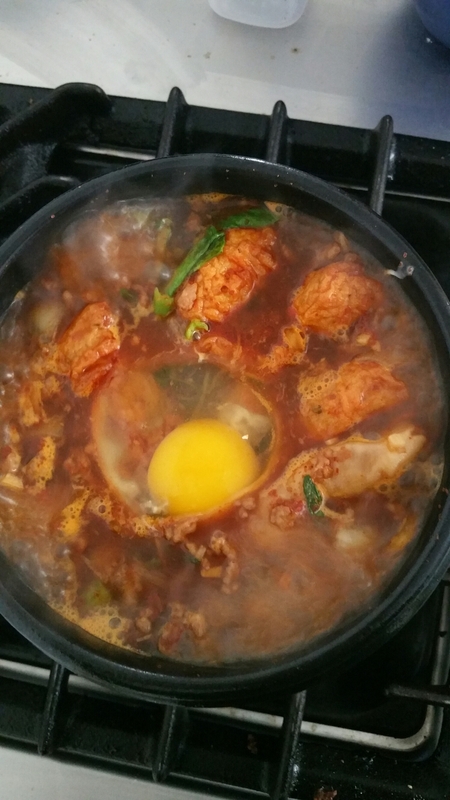 Wait about 5 minutes for the edges of the white to cook (the egg will continue to cook, with a very soft yoke, after the pot is taken off the heat). If you’d like a firmer egg, try poaching it separately or turning the burner to med-low and covering. Serve with warm rice and your choice of side dishes. 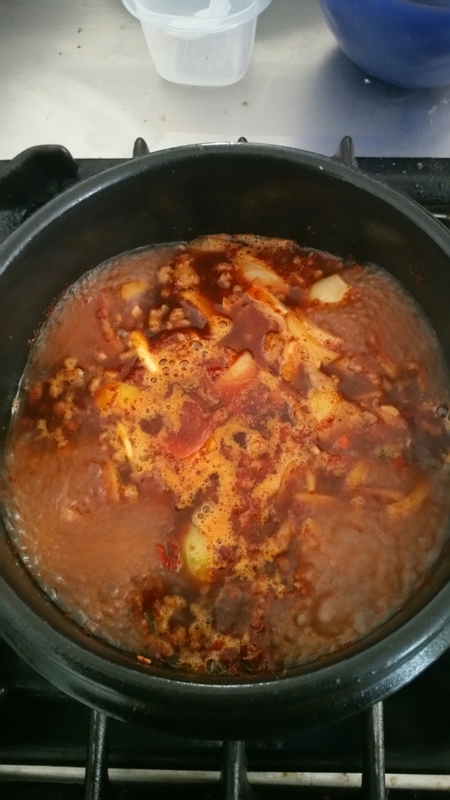 This entry was posted in Recipes and tagged jjigae, korean cooking, maangchi, recipe, spicy stew, stew. Bookmark the permalink.